Captain Jeric Fortuna; Maraming Salamat Pards! There is no denying that Jeric Fortuna is one of my favorite players in the UAAP. I am not biased because I know him but because he really is someone you can look up to both in and out of basketball. Siya yung mga tipong alam mong pinakalaki ng magulang ng maayos. I first met him when my ex-girlfriend from Zobel, Trix, introduced him to me in one of the UAAP games. Back then kasi, Ateneo and La Salle Zobel were the strong teams in the UAAP juniors, so since my ex-girlfriend and I watched the games before, he introduced me na rin to her friends in the team. So from then, I was able to meet some like Jed, JerFor and others. So yeah, back then it was painful kasi they beat us in the Finals but then he and Jed and JerFor told me na okay lang yan. Haha. But back then, di ko pa idol si JerFor. Haha. I respected him as a player but not really as a fan. It was in the UAAP na na-impress ako sa kanya. I even asked my La Salle friends kung bakit siya hindi kinuha ng La Salle before. In fact, he had a pic taken na nga with the Yuchengco building in the background, kumbaga ready for La Salle na. For years, I followed his career and rooted for UST in some games especially when he was making those 20+ points. I am not a big fan of point guards kasi talaga eh. After LA Tenorio and JV Casio, si JerFor na talaga yung next na nagustuhan ko. So yeah. Just two months ago, I had the opportunity of talking to him again, this time sa UST gym naman. We talked about mga high school and college stuff and other things na kami na lang ang dapat makaalam. Haha. And then, we talked about stuff then especially how bad he wanted to win this championship. Just a few weeks back, nung nagtetext kami, he told me, “Pards, kami naman. naka-4-peat na kayo. Hehe.” And then I said, “Tignan natin. Whatever happens, magiging happy ako for both teams. Haha.” But really, in our texts, you would see how good this man is. He even offered to eat before when I went to UST with Lhea and Benj. And dati, he told me how he motivates his team. He just doesn’t want this championship for himself but for the whole UST community talaga and the team mismo. He really is appreciative of the UST fans and he said na this is not an every year thing kaya kung maari ma-take advantage sana nila na manalo kung kaya. Hindi naman din daw every year na ganyan kasaya ang UST sa basketball. From then, I saw a guy who is sincere and is serious about winning for their school and not for personal matters. Just a while ago, I realized na that was his last game na nga pala. I felt for him especially when he was crying sa court and he was being emotional. 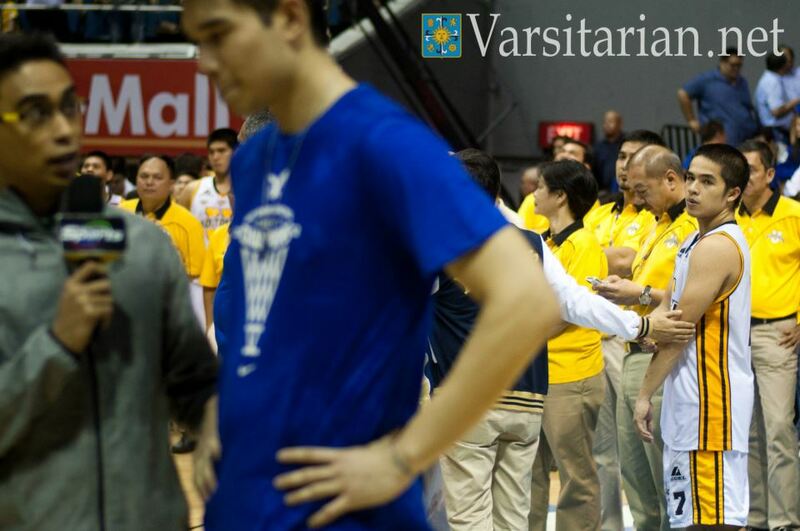 Even though Ateneo won the five-peat, I don’t know why but I felt sad for him. After all he has been through parang naawa ako na something. I don’t know. I haven’t texted him pa. Baka bukas or kung magsubside na yung emotions. But surely I will.